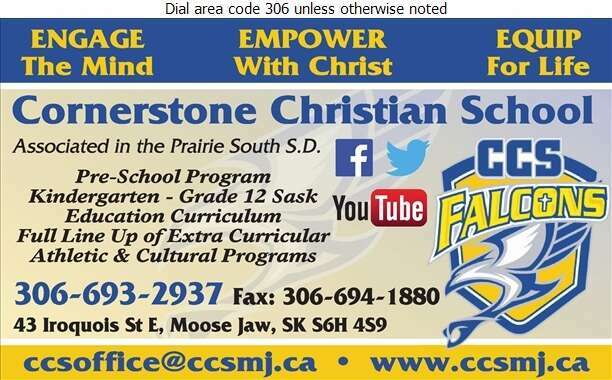 Cornerstone Christian School is an interdenominational Christian school located approximately 45 minutes west of Regina in Moose Jaw, Saskatchewan. The school offers a pre-school to Grade 12 program, with fully certified Saskatchewan Teachers Federation (STF) teachers. It has provincial status as a Society School in the legislative framework for independent schools in Saskatchewan. 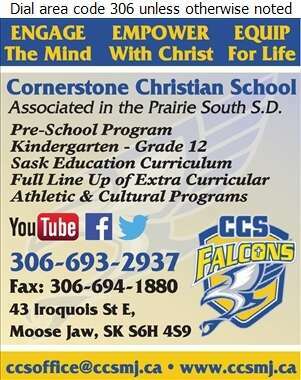 CCS offers strong programs in athletics, drama, and music but we seek to minister to the soul of each student as well. Working with the many different churches represented by close to 300 students in this school, we seek to develop strong Christian character in our students that will stand the tests of time, peers, and the travails of life.